Later this morning, Huck Gee will be releasing a beautiful new series of Gummi Skullhead Blank resin figures! These Gummi Blanks are Huck’s next experiment of the Blank form, designed for collectors and customizers alike. 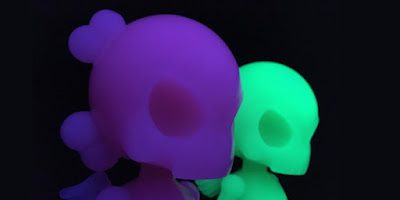 There will be four translucent glow in the dark flavorways released (red, yellow, purple and green), with each color limited to just 50 pieces. Every Gummi Blank resin figure is hand cast, comes signed and numbered, and stands 7” tall with multiple points of articulation. Fans can purchase these awesome figures starting at 10am PST today, Saturday, April 22nd, at the Huck Gee online store for $125 each.